Treat Dementia better! Dr. Mike Chua’s website has a free “MisUnderstanding Dementia Worksheet” and free Ebook to help practitioners and families care for those with Dementia! Dr. Mike Chua’s also has an amazing course which provides strategies on how to take care of patients or loved ones with Dementia. Just for podcast listeners, the first 50 listeners can use the code “fire” to get Mike’s course on better understanding dementia for FREE! 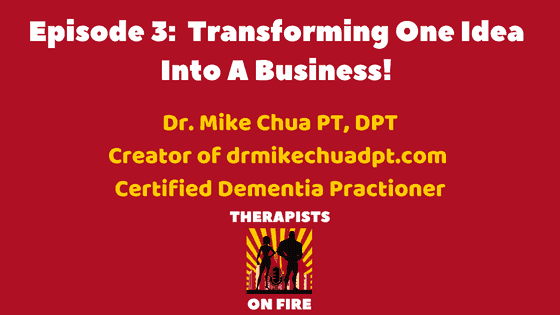 1:10 How Dr. Mike Chua discovered his niche business: caring for those with Dementia. 3:42 Certified Dementia Practitioner requirements. 5:11 How Mike titled his book and self published MisUnderstanding Dementia. 7:05 How to scale your business using one great idea. Mike published the book “MisUndertanding Dementia” and from this created his MisUnderstanding Dementia Course and also offers personal consulting/Telehealth on the subject. 10:10: How to run your business successfully. 11:58 Finding a good virtual assistant. 14:15 Entrepreneurs biggest struggle: trusting others. 15:41: Virtual assistant apps and why you need to hire a good VA.
19:27 How to create Facebook Live videos in your car. 25:29 How TN therapy staffing works with home health agencies and earns passive income using employees. 32:04 How to delegate to manage your time and maintain your sanity! 33:45 Mike’s advice to new entrepreneurs: “Just do it.” If you are not part of the solution, you are part of the problem! 35:58 Where you can reach mike and get his free book and course! Scale your business by finding a niche and then creating several products from your niche such as books, courses, consulting. Branding into tele health is the new wave for solo entrepreneurs! If we stop pushing forward we won’t succeed! Don’t put limitations on yourself, business is about trial and error. Have multiple social media platforms : videos, Facebook, books, podcasts, courses. VAs should already know the technology and tell you how to be more productive! Delegate! You do what you do best and delegate the rest to others that are an expert in that field! To stay up to date on all podcast releases, please like and follow the THERAPISTS ON FIRE FACEBOOK PAGE! 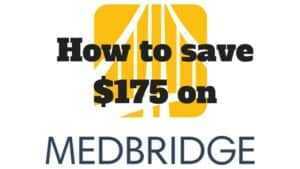 Click Below To Save 45% off Regular Price For Unlimited Live and Online CEUs! 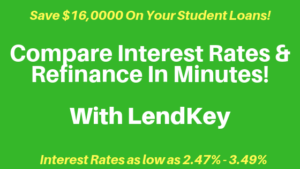 Click below to save $16,000 on your student loans in minutes and earn $200 when you refinance for free! Start learning to travel today with my book! Strategies To Overcome Healthcare Burnout And How To Get Your Facility To Listen! Get top student loan tips to your inbox! Thank you for signing up for the travel mentorship program! See private policy and disclosure page for more information. Above pages may contain affiliate links.